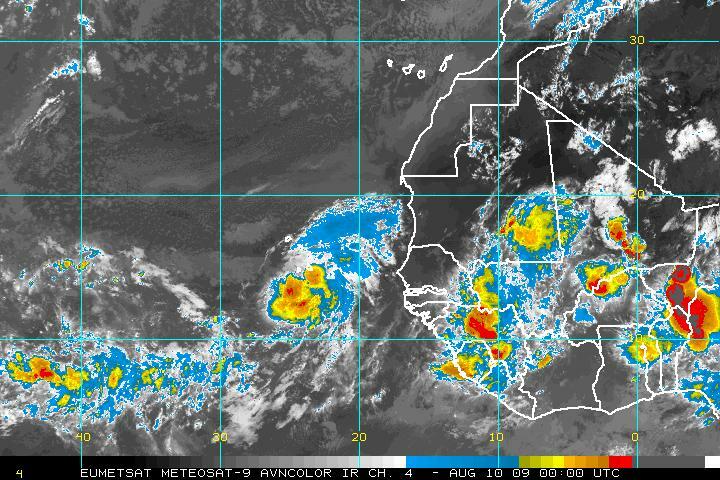 Satellite imagery shows a strong tropical wave near the Cape Verde Islands. Forecast models develop this system some then recurve it east of the Lesser Antilles into the open Atlantic. That's still many days away though. We are in recon mode on this one. Right now, we are simply keeping an eye out for further development. 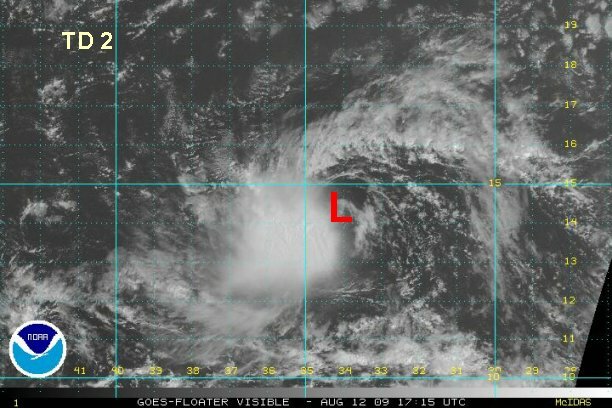 The "L" on the satellite image does not denote a tropical depression but center of the tropical wave. Not many changes from earlier today. 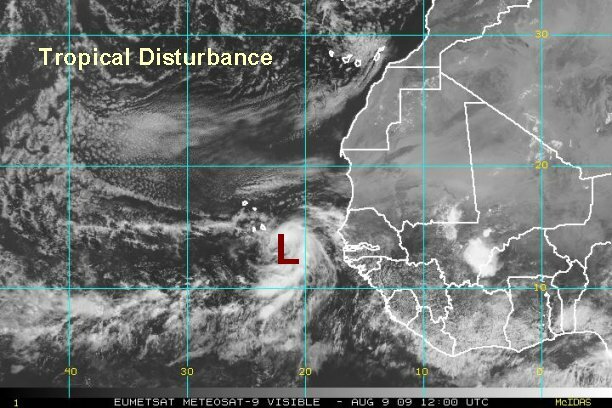 The tropical disturbance is still on the verge of becoming a tropical depression. 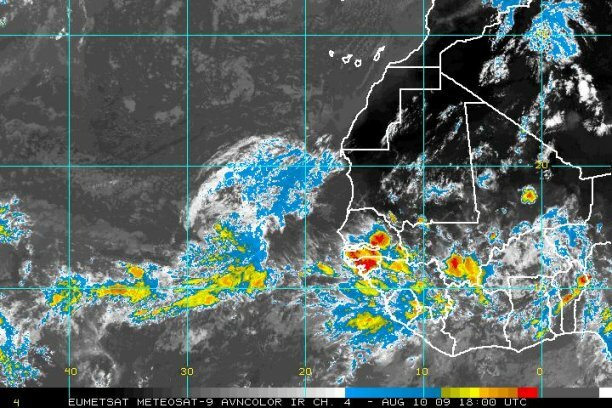 Convection has been steady with the tropical wave. Tropical weather forecast models continue to recurve this system well east of the Caribbean. Deep convection is holding on near this strong tropical wave. We agree with the National Hurricane Center that this is not quite an official depression yet, but has a good chance to become one soon. Overall, not many changes to speak of on the structure from last night. 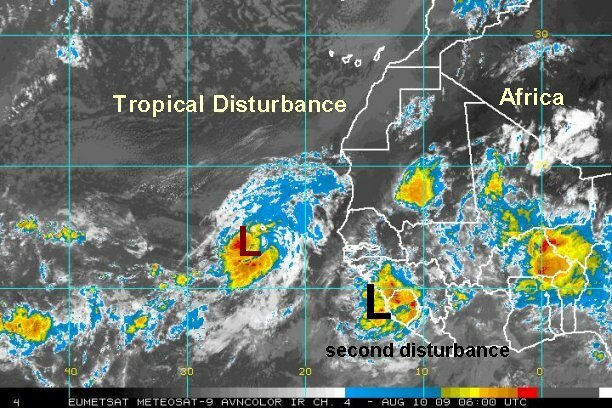 The second tropical wave on the coast off Africa concerns us much more. The models take this one a lot farther west. Good news so far. Both of the waves that the tropical weather forecast models develop have not shown any changes today. There is still no sign of concern. Travelers to the Caribbean should keep an eye on the situation. 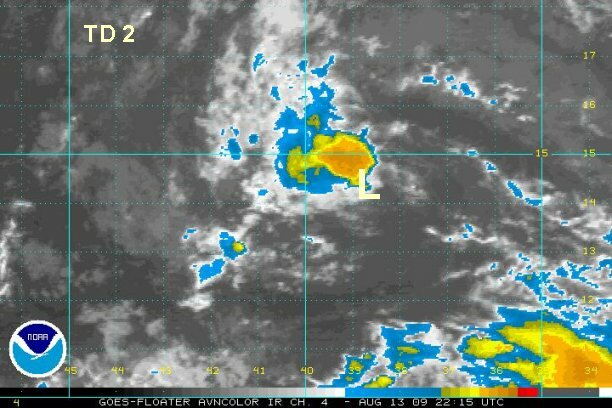 The latest Quickscat has now confirmed a closed circulation with what was our strong tropical wave. Because of this, we are in agreement with the National Hurricane Center that this is now a tropical depression. A small ball of convection remains with the circulation of the low. 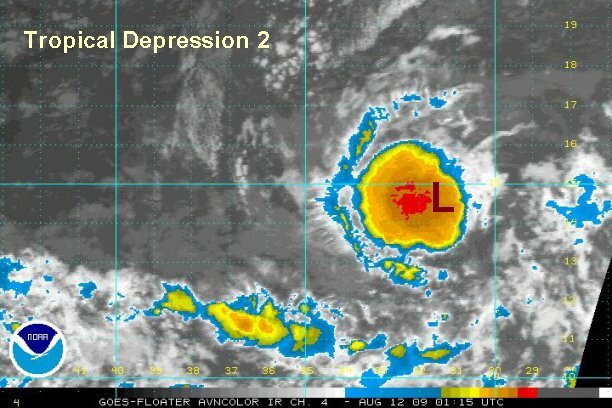 At 7:00 am edt tropical depression 2 is centered near 14.4° N 28.6° W or about 280 miles west southwest of the Cape Verde Islands. Its moving west at about 13 mph. Forecast models have been doing well with this system so far and have not backed off recurving it well east of the Caribbean Islands. For vacationers traveling to the Caribbean, keep updated on this system. At this time we not concerned. The second wave farther south poses a greater threat, but is still too far our to make concrete forecasts. Unfortunately the Quickscat satellite "missed" tropical depression two on its last two passes. The "window of nothingness" is over where we would really like to see the data. Even so, we think tropical depression 2 is close to becoming tropical storm Ana. If we had the Quickscat we could have been more definitive. A large convective burst is near and west of the center. If this continues, Ana will be classified tonight. At 10:00 pm edt tropical depression 2 is centered near 14.6° N 31.6° W or about 440 miles west southwest of the Cape Verde Islands / 1900 miles east of the Lesser Antilles. Its moving west at about 13 mph. Forecast models generally still recurve this system east of the Islands, although closer to the Leewards in several days. For vacationers traveling to the Caribbean, keep updated on this system. At 7:30 am edt tropical depression 2 is centered near 14.9° N 33.0° W or about 530 miles west southwest of the Cape Verde Islands / 1800 miles east of the Lesser Antilles. Its moving west at about 13 mph. This is a little farther northwest than the National Hurricane Centers position at 5 am edt. NHC mentioned some difficulty in exact center placement in their earlier discussion.....exact center placement is not always an easy task at this stage of development. Quickscat suggests that there are light 10 knot winds on the east side of the circulation and 30-35 knots winds on the west side. This is very close to tropical storm strength. The convection has persisted and we think the Hurricane Center will name Ana at 11 am edt advisory. Forecast models generally still recurve this system east of the Islands with only modest development. The models develop the next tropical wave following tropical depression 2 much more vigorously. For vacationers traveling to the Caribbean, keep updated on this system and the next. We'll, NHC will not classify Ana at 11am....they're waiting a little longer. Quickscat has an estimate of 45 knots in the deep convection west of the center and another satellite estimate has 49 knots. Earlier this morning tropical depression 2 made a strong bid at becoming Ana with tropical storm force winds on the western side of the circulation. Today easterly wind shear has pushed back convection several times. The center of circulation is resting on the edge of the convection. 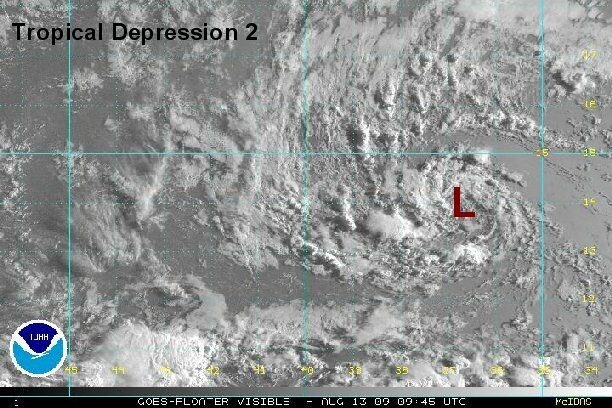 At 2:30 pm edt / 2:30 pm ast tropical depression 2 is centered near 14.4° N 34.1° W or about 610 miles west southwest of the Cape Verde Islands / 1725 miles east of the Lesser Antilles. Its moving west or slightly south of due west at about 13 mph. Recent Quickscat still estimates winds of 45 knots on the west side of the circulation under the convection. Winds are weak on the eastern side - about 10 knots. We estimate top sustained winds at 35 mph in the southwestern squalls. 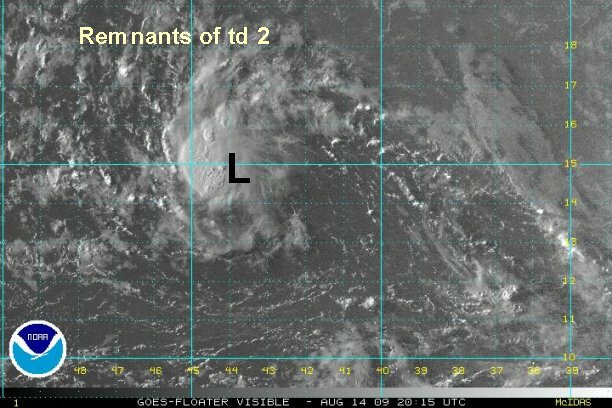 If wind shear weakens, tropical depression 2 may achieve tropical storm status quickly. T.D. 2 is struggling. East northeast wind shear has continued to keep the depression weak. After apparently reaching tropical storm strength for a short while early this morning, weakening now has ruled. At 9:30 pm edt / ast tropical depression 2 is centered near 14.1° N 35.9° W or about 1675 miles east of the Lesser Antillies. Its moving west southwest at about 16 mph. Earlier Quickscat estimates winds of 40 knots on the southwest side of the circulation. 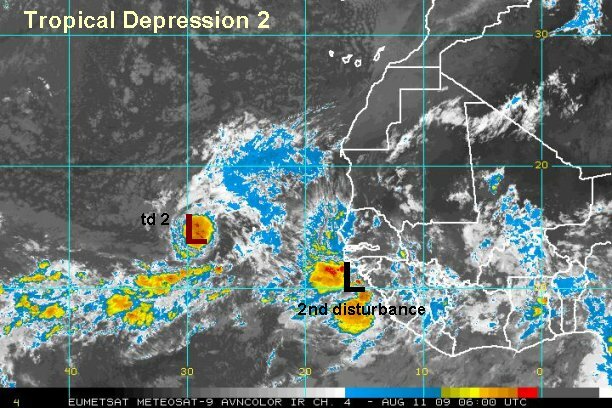 Tropical depression 2 has continued to weakened since then. We are now estimating top sustained winds of 30 mph. 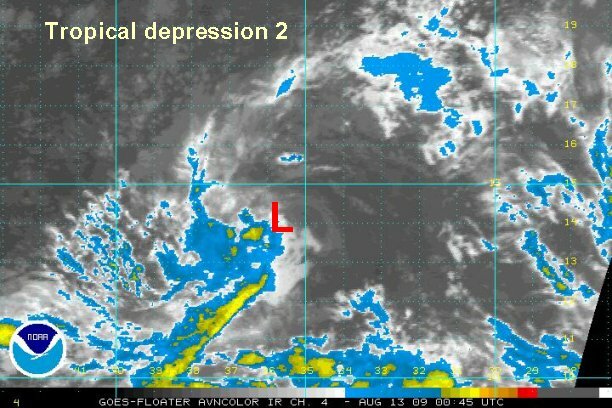 Overnight has brought little change to tropical depression 2 except for a slight direction adjustment. There is little convection with the broad low level center. At 6:00 am edt / ast tropical depression 2 is centered near 14.2° N 37.0° W or about 1600 miles east of the Lesser Antilles. Its moving west northwest at about 12 mph. This direction change was noticed over the past few hours. Quickscat only had a partial observation. The eastern (weak) side still only has about 10 knot winds. We are now estimating top sustained winds of 30 mph. This agrees with the National Hurricane Center and is probably a generous estimate. 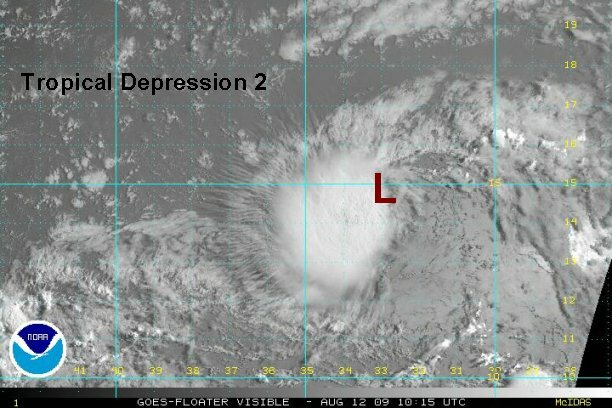 Tropical depression 2 is barely holding on. At 11:30 am edt / ast visible satellite shows a broad low center near 14.0 N / 37.6 W or about 1565 miles east of the Lesser Antilles. A small cluster of convection remains a little west north west of the circulation center. It is moving west at about 9 mph. Top sustained winds are estimated at 25 mph, with some gusts higher in the thunderstorm cluster. Forecast models take this system westward for a few days, then west northwest in a weak state. 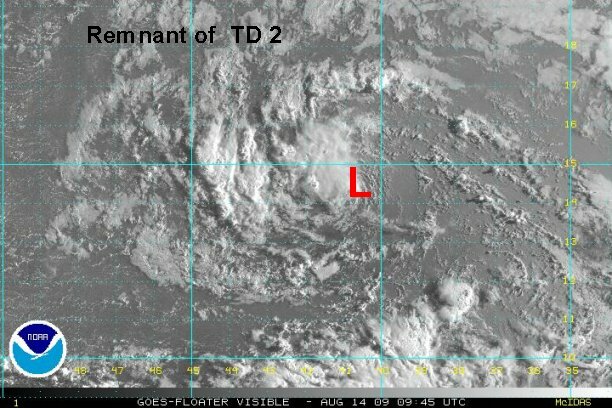 The circulation from tropical depression 2 has regained just a little more convection. At 7:00 pm edt / ast I.R. 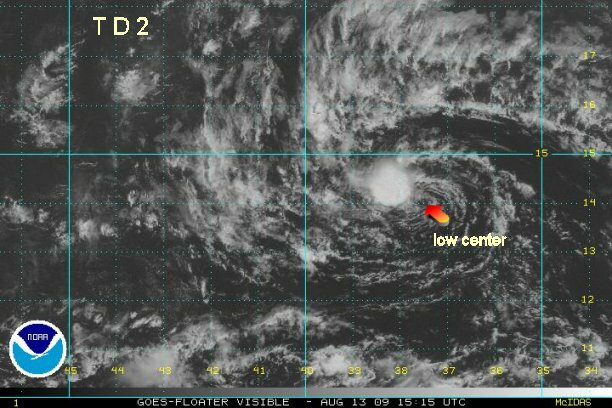 satellite shows a broad low center near 14.2 N / 38.9 W or about 1490 miles east of the Lesser Antilles. A small cluster of convection remains a little west north west of the circulation center. It is moving west at about 10 mph. Top sustained winds are estimated at 25 mph, with some gusts higher in the thunderstorm cluster. We will continue to follow the remnant of tropical depression 2 since there is interest for travelers to the Caribbean and Bermuda. A small ball of convection remains with the circulation to the west and near the circulation center. It continues to struggle from wind shear, but is actually a little more organized than yesterday. At 7:00 am edt / ast the remnants were centered near 14.5 N / 41.0 W or about 1340 miles east of the Lesser Antilles. It is moving west at about 14 mph. Top sustained winds are estimated at 25 mph. We are continuing to follow the remnants of tropical depression 2 since there is interest for travelers to the Caribbean and Bermuda. The remnants of td 2 are still motoring west. Convection has actually increased a touch the last few hours on the west side of the circulation. At 5:00 pm edt / ast the remnants were centered near 14.8 N / 44.0 W or about 1135 miles east of the Lesser Antilles. It is moving west at about 15 mph. Top sustained winds are estimated at 25 mph, with some higher gusts in the thunderstorm cluster.